In the lives and “careers” of most deer hunters, a process takes place over time as the desires of a hunter mature. At first, just shooting a deer, any deer is satisfying. 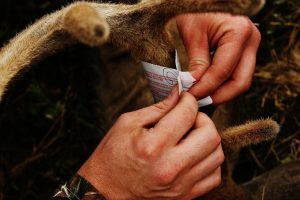 Then shooting a number of deer becomes a priority and the third stage of the process takes place when the hunter desires to bag a unique specimen of the species. That might mean holding out for a true giant, or it might mean travelling in order to have a chance at bagging a subspecies. Or it might mean the desire to collect a whitetail buck while it’s in velvet stage. Whitetails across North America tend to shed their velvet during the first week in September. Sometimes the fuzz can come off during the last week of August, but the majority will become hard-antlered between September 1st and 7th. There are a handful of locations across North America where you can legally have a great chance of shooting a velvet buck at this time. These opportunities offer several positive aspects to the hunts. Not only does the season open early when the majority of the bucks have not yet shed their soft antler covering, but these bucks are in some of their most consistent and predictable patterns of the year. They are quite visible at this time of the year, plus they are focused on bedding and feeding every day. These bucks follow a daily routine that makes them very patternable. Shooting one is about as close to a slam dunk as you can get in whitetail hunting. Here are my top five picks for getting a velvet buck for your trophy collection. North Dakota is a gold mine for the Do-it-Yourself bowhunter. Public land is abundant and there are still places where hunting permission will be granted on a handshake. Tens of thousands of acres of US Army Corps of Engineers (ACOE) land surrounds the Missouri River and its reservoirs, and all of them are open to public hunting. Much of it is grassland, but food plots, shelterbelts and oak groves left over from century-old farmsteads attract whitetails. Lake Sakakawea is a huge reservoir 125 miles long and almost the entire shoreline is ACOE land. You could spend a lifetime poking around looking for whitetails. Much of the area has a very low human population and little hunting pressure during archery season. North Dakota also offers a program known as PLOTS: Private Land Open to Sportsmen. Landowners allow public access to their land through this program. The good news about PLOTS land is that no access by any type of vehicle is allowed. It’s walking only. The vast majority of this land is prairie that attracts bird hunters, but the hunter who does his homework can find small pockets of great whitetail habitat that rarely get hunted. Because it is walking access only, anything that is a mile or so from the nearest road may never see a deer hunter. Most locals have a place to hunt where they don’t have to hoof it so far. Surprisingly, few nonresident hunters take advantage of North Dakota’s whitetail opportunities. You will have to do your homework and be willing to work hard to bag a buck in North Dakota, but if you like the challenge of a DIY Road-trip, this could be the hunt for you. A nonresident deer license is only $215. The archery season opens the Friday closest to September 1st each year. While the Northeastern part of Montana gets a lot of publicity for whitetail hunting, the Southeastern corner of the state has quietly been producing some really nice bucks. Because the season opens September 1st, there is a short window of opportunity to bag a velvet buck. 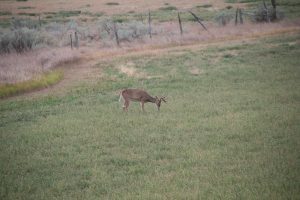 This area has escaped the plague of Blue Tongue disease and winterkill that has caused a crash of the deer population in Northeastern Montana. Look to the lowlands along the Powder River and Tongue River watersheds for numbers of whitetails and a quality of deer that will surprise even the seasoned bowhunting road-tripper. This is arid country with river bottoms surrounded by sagebrush-covered hills. The deer bed in the cottonwood groves during the day and move out into the irrigated alfalfa fields to feed. Their patterns are very consistent and the sheer numbers of deer are striking. It is not unusual to see 50-plus deer per sitting. The first week in September last year I saw nine Pope & Young bucks in velvet during a four-hour evening sit in 90-degree heat. The majority of the properties with good deer populations are leased by outfitters. 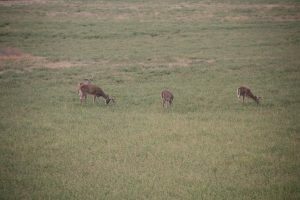 Most outfitters offer hunts for whitetails and mule deer, plus antelope if you want to combine the two into one hunt. 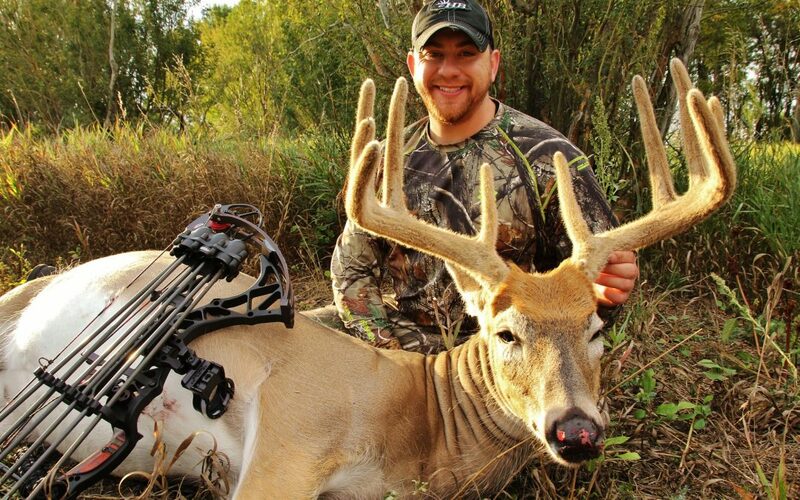 This is one of those hunts that every serious bowhunter should put on their “Must Do” list. It’s that good. I bagged a great 10-pointer in 2012 with Blue Rock Outfitters and I can’t wait to get back there. Montana is proud of its nonresident hunting tags. The tags and licenses will set you back $552 for the any-deer tag. This allows you to shoot a whitetail or a mule deer. You must apply by March 15, but for this area you will draw every other year and sometimes in consecutive years. You can spring for the more expensive Elk/Deer combo license which guarantees you a deer tag; then if you do not hunt elk you can apply for a refund of the elk portion of the tag. Alberta has long been known to produce trophy whitetails due to its low hunting pressure the cold northern climate that dissuades all but the hardiest hunters during the frigid rifle season. But for bowhunters, Alberta is not at the top of their destination list. It should be on your list because of the opportunity to take a whopper in velvet during the first week of September. In fact, there some large areas designated primitive weapons only. The licenses and fees are very reasonable at $196.57, but the catch is that nonresident hunters must be “hosted” by an Alberta resident. Unless you have a friend or family member in Alberta that has access to good hunting land, you must go with an outfitter. One other option is to trade a trip. You might find an Alberta resident that would be willing to host you in exchange for a hunt in your home area. Southern Alberta is prairie land, the North is boreal forest, and the western part of the state is mountainous. Nestled between those areas is the “Forest Fringe”, commonly called the “Parkland” by Alberta residents. This combination of farms, open prairie and patches of “bush” is where you will find the best early season hunting. The deer tend to bed in the heavy cover of the timber blocks and feed in the open fields. They are quite visible and patternable in this flat country. Whitetail numbers are not high here but the quality makes up for the lack of quantity. Occasionally, bucks will bed for the day in open fields and can be taken by spotting them in the morning, watching them bed, then putting the sneak on them when they have settled in. This is not a high percentage tactic but it is exhilarating and it sure beats sitting around camp all day. Bagging a mature whitetail this way is one of the most rewarding feelings in deer hunting. Much like southeastern Montana, this area in no way resembles typical whitetail country to the Midwestern or Eastern hunter. But the water and fertility of the land associated with the riparian areas produces whitetails in significant numbers, and the scarcity of local whitetail hunters allows them to get mature. This part of the west is not much of a secret any longer so outfitters have grabbed up the majority of the best ground. There are a few places where you can get permission to hunt but most of the landowners have figured out that people will pay to hunt the whitetails that they consider vermin. If you are willing to put in the time and knock on a lot of doors, you can find a place to hunt on your own. Cottonwoods and alfalfa are the two main keys to whitetail location in the early season, although the bedding areas may be in a pine grove a mile or more from the feeding areas. It is common for whitetails to cross large areas while they make their way to the fields to feed in the afternoon. They commonly walk even two miles or more. This makes them very visible. 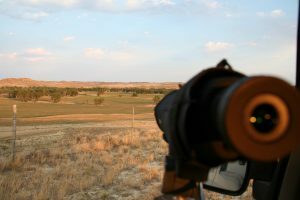 A spotting scope is an essential tool for locating them. But once they are found, it’s a simple matter to get in position for their morning or evening trek that mostly takes place during the first two hours and the last two hours of daylight. Wyoming’s archery deer season opens the first of September but you must apply for your tag each year before March 15. Drawing odds are very good and you will find a deer tag in your mailbox most years. The western half of the state of Kentucky has earned a well-deserved reputation for being a quality whitetail destination. In the last two decades, the numbers of mature deer being shot by residents and nonresidents has been steadily rising. Offering an archery season opener that falls on the first Saturday in September, this Midwestern gem offers yet another opportunity to bag a great velvet buck and it’s a bargain at $190 for over-the-counter tags and licenses. For hunters without the budget to spend on a fully outfitted hunt, this area offers an abundance of public land open to hunting. Western Kentucky features two expansive public areas in the 100,000-acre Land Between the Lakes Wildlife Management Area, and the 65,000-acre Peabody Wildlife Management Area. In addition to that, there are several smaller WMAs ranging in size from less than 1,000 acres to more than 8,000 acres. The area is well populated and you will not be alone on this public hunting ground, but if you are willing to do your legwork–get a mile or more off the road–you will find minimal hunting pressure. Landowners are generally somewhat open to allowing bowhunters access to their property. Not so much for rifle hunters. While there are a handful of outfitters operating across the western part of the state, there is no shortage of private land that is not bound up by hunting leases. Patterning these big woods bucks in September is not nearly as easy compared to what you’ll find out west. Much of the acorn crop is on the ground and natural foods are abundant and spread out across the landscape. This is often thick and steep country so you will need to work hard to get your buck, but if you have a good plan and execute it well with hard work and determination, you will see some great deer. The unique trophy of a velvet-antlered whitetail is one that can be found in only a handful of places. If you start your planning now you have a chance to get yours. Season opener: Noon on the Friday nearest September 1.